Be a voice for cycling in your community and lead a “Ward Ride” this Fall. 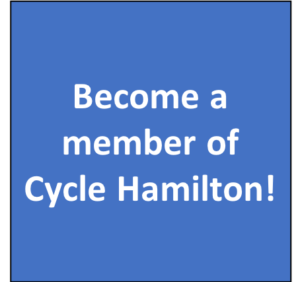 As part of our election advocacy strategy, Cycle Hamilton is seeking a volunteer(s) from each of our city’s 15 wards to host a bike ride for local election candidates. These rides are meant to be a fun & informative way to engage with all candidates about cycling in #HamOnt and in their ward. To help you plan the ride, we have developed a route planning “tip sheet”, some sample talking points and email templates you can use to reach out to candidates. (https://docs.google.com/document/d/1lcNugSe8zrE4FWQqjI-GH8XBlsXxo7aPUi2Af4curgE/edit?usp=sharing). Planning for rides in Wards 1, 3, 4, 6, 7, 10, 13, and 14 are already underway, and the ride in Ward 2 has already taken place. If you live in Ward 5, 8, 9, 11, 12, or 15, we need to hear from you! Thanks for your help in advocating for a more bicycle-friendly Hamilton. Feel free to join the ongoing discussion on social media using the hashtag #iBikeiVote. ← Win a cycling prize with this year’s Fringe Festival! One Response to Needed: Ward Ride Leaders! I am interested in co-organizing a ward 8 ride. Anyone want to join me?